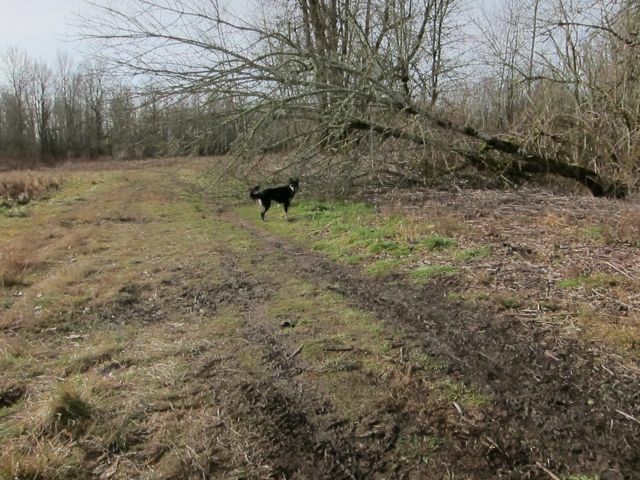 This entry was posted in Dogs and tagged 1000 acres dog park, columbia gorge, Mud-puddling, pot of gold, rainbow, Sage by Sage. Bookmark the permalink. Sage, I could see what a wonderful time you had!!! It came through the puter right to us Sage!!!! So happy you are happy!!! We see a lot of rainbows here in the spring and summer – we are just going to have to follow one of them and find that glorious mud!!! Sage, you look like you had a blast. Wow…now that’s truly a pot of of gold! The FiveSibes would love to have followed you and played in those great mud holes, especially our resident mud monster, Wolf! (Yep, of course he’s pure white. I think he wishes he was brown!) Great pics of a fun day, Sage! Keep following those rainbows, and we’ll have to check out our next one to see if there’s some golden mud puddles too at the end! Happy splashing! Glad your family is back together. That would be the pot of gold at the end of my rainbow. The trip to 1000 acres would just be mud on the puddle. Wow Sage, look what you’ve found! I love your pictures, what a wonderful day. You are so cute that I actually called my Hubby over to look at you with me. He never likes to look at the blogs I follow, but he really enjoyed seeing you so happy. You know, Sage, you’ve got a pretty great mom to deal with your mud. She obviously loves you so very much. Oh, my, Sage – you are a wonderful, muddy, wet mess! So glad my free roam Beagle, Shiloh, isn’t with you. He visits the nearby pony farm – mmm, mmm, good manure to bring home to me. Sigh – what a wonderful rainbow chase you had! Thanks for visiting my blog. Good job milking that guilt card, Sage! You look SOOOOO happy in your pictures! Glad your family is home again! 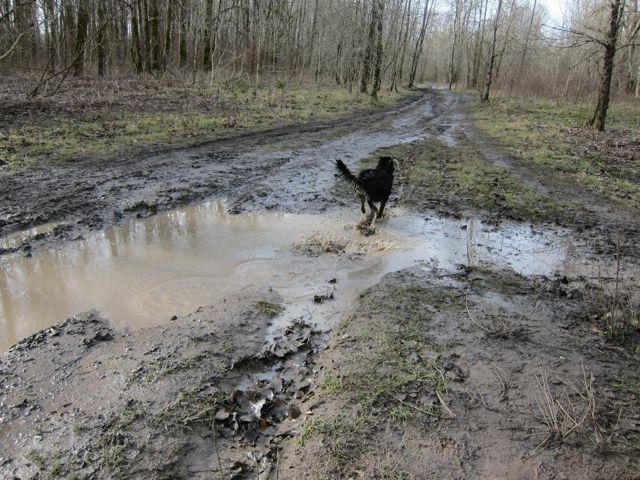 You just crack us up with your obsession for mud! A real OREGON dog, fur sure! 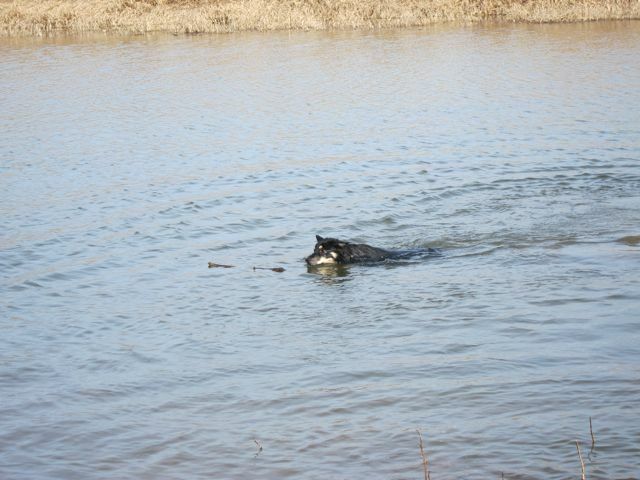 Your Mom is so great about taking you to 1000 acres and letting you wallow. Think she might want to adopt me? What a great rainbow shot! You sure do like mucking about! LOL! 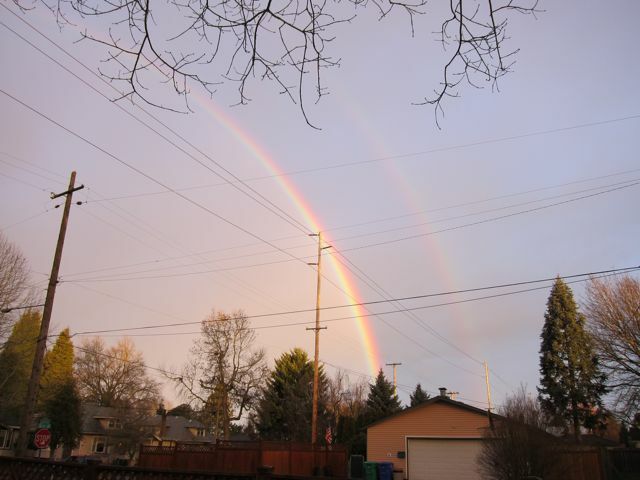 Wow, beautiful double rainbow! I loved your adventures of follow the rainbow!! 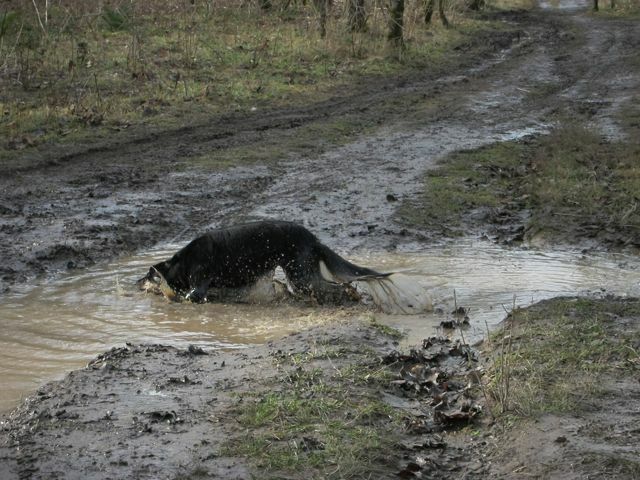 Such fun muddy puddles to dip in! that’s one of the best Muddy Mondays yet! jealous! Wow, you it the MudPot fur sure Sage! Oh Sage. What a great day you had. 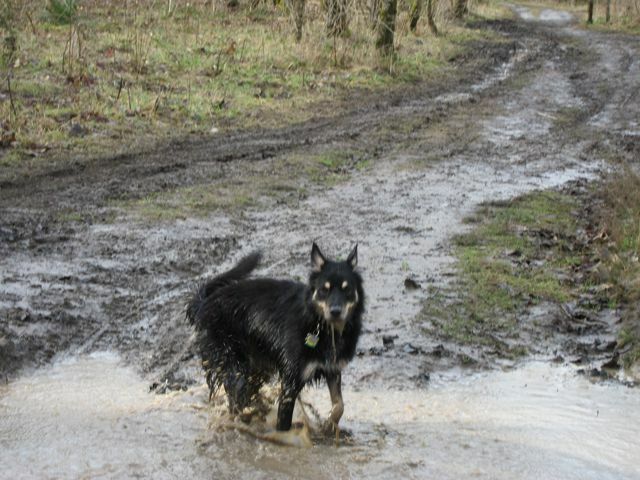 I would have loved to run with you through those mud puddles. My Vickie tells me that she and Jamie did a lot of searches in the Portland area and that it was the most beautiful place ever. She loved the Columbia Gorge area and when they came up your way to help train the search dogs in your area, they stayed in a little cabin up by Mount Hood. She said your pictures made her really miss that. And she wanted me to ask your human if you have ever eaten a Salmon Berry. When she was on a search up there one fall, there were hillsides of the tasty orange berries and she ate until she got sick. But when she asked if anyone else had eaten them, no body knew what she was talking about. So do you guys know where the Salmon Berries are? I agree! You do have to follow your own rainbow! I’m glad you found your pot of mud at the end of yours, too. You have some beautiful pictures today, Sage! What a beautiful double rainbow! Always a great sign for a good MUD day!! Wow that looks so much fun, especially the swimming part. 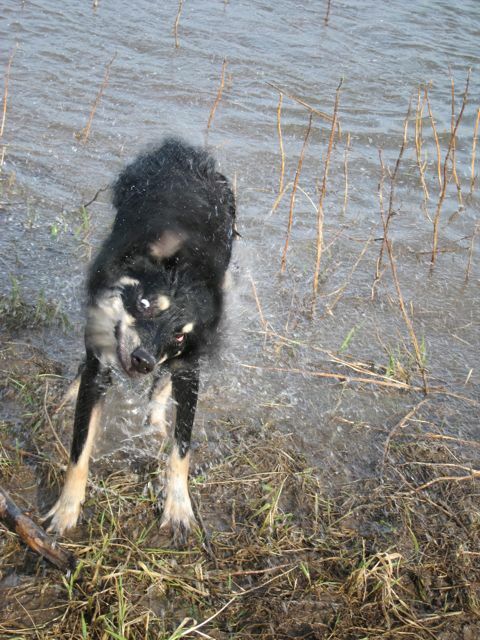 I know you’re a big dog and love the water, even though I hate it. 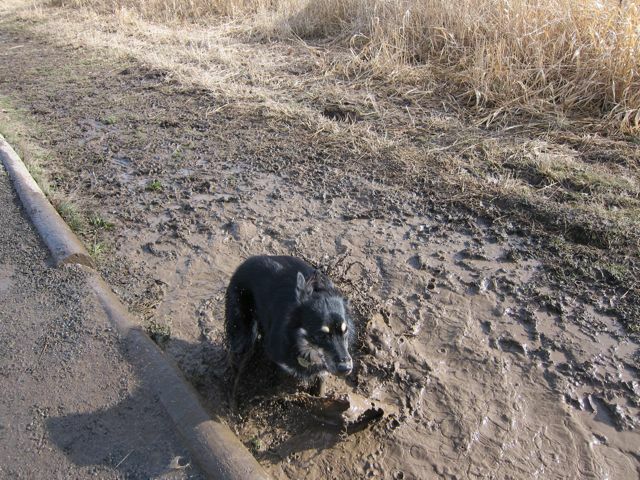 But still… the mud also looks like fun times! Rainbows come out for a reason, Sage and it sure gave you a smile and mud rub…so cool! PS Thanks for commenting on my recent post…I’m using a new reply system from blogger and still ironing out the wrinkles…Cheers! Makes pawfect sense to me – dubbull rainbow makes fur dubbull mud puddulls! I’ve got to make sure I go out next time there’s a rainbow. A mud hole and a swimming hole. What could be better! You are such a silly girl! We would be best mud buddies for sure! 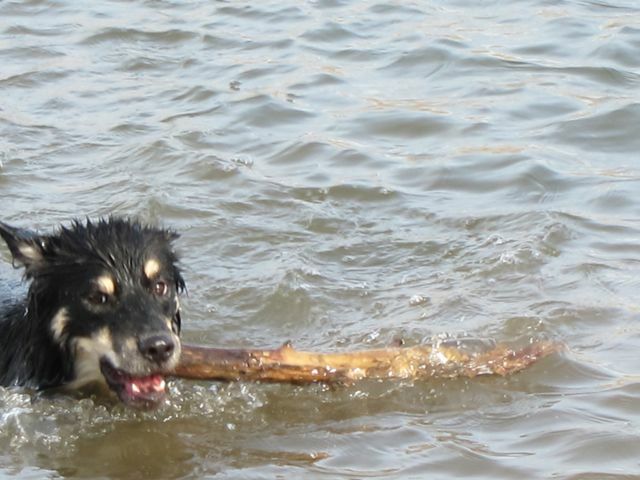 You sure had a lot of fun and we loved the pictures especially of you in the water with the stick! You looked so happy!!! !